On this date in 1568, Leonor de Cisneros was burned as a heretic in Valladolid — nine years late, by her reckoning. Leonor de Cisneros (English Wikipedia entry | a token Spanish Wikipedia entry | the much more detailed German) and her much older husband Antonio Herrezuelo* were among the first converts to the Lutheran circle in Valladolid funded by Don Carlos de Seso. The Inquisition got its hands on these wrongthinkers in the late 1550s and the result was an auto de fe on October 8, 1559 at which King Philip personally witnessed the Christlike suffering of Don Carlos and 12 of his adherents. However, while 13 died, dozens of others succumbed to the Inquisition’s pressure to recant, and live. Leonor de Cisneros was one of them. The monstrous spectacle of the auto de fe featured an elaborate symbolic language encoded for the spectators in the ritual sanbenitos in which the accused were made to parade, such as the example pictured at right. 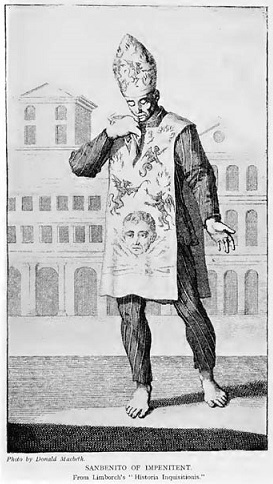 ** Different patterns denoted which heretics were bound for the stake, and which had reconciled to a wary Church … and it is said that when Antonio, en route to his pyre draped in illustrations of hellfire to represent his fatal obduracy, beheld his wife in the colors of a penitent, he savagely reproached her cowardice. Obviously shaken, Leonor returned to her prison with a prayer in her soul and a flea in her ear. Soon enough she had relapsed into her heresy, and this time no punishment or exhortation could move her — knowing as she well did that in her stubbornness she solicited her martyrdom. * Leonor was born in the mid-1530s, so would have married and converted to Protestantism around the age of 18. Antonio was born about 1513. ** Source: this public-domain volume on the notorious Inquisitor Torquemada.